Read our list on the best salad bars in the city and discover great places to pop into for a fast, healthy, guilt-free dose of greens. The recently opened Nosh, by Glowbal at TELUS Garden, offers weekday diners many delicious grab-and-go items, including a range of light, flavourful and nourishing prepared salads. In addition to these signature salads, patrons can also compose their own salad, choosing from a selection of ingredients, which include meat, seafood, tofu, chickpeas, marinated vegetables, cheeses and nuts. 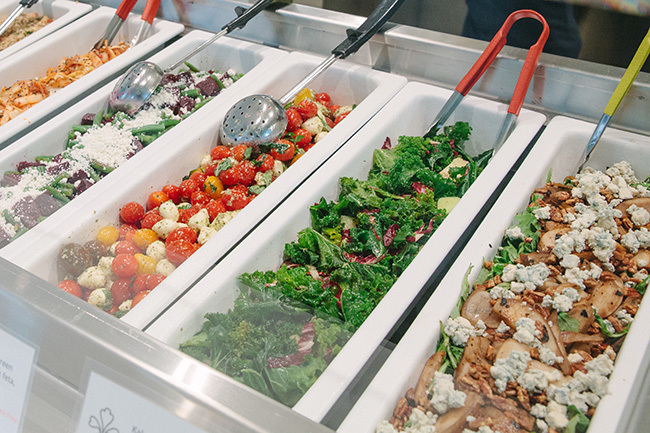 Laden with vegetables, Nosh’s salads are a quick and convenient way for downtown residents, workers and shoppers to get a healthy midday boost. Focusing on creating fresh, healthy food that does not compromise flavour, Tractor Foods delivers quality, great-tasting and hearty salads. While diners may not have control of the tongs per se, they do have the power to decide what salad goes onto their plate or into their take-away container. In addition to a few entree sized salads, Tractor Foods displays a range of veggie salads, which can be mixed and matched together. For just under $10 diners can order a plate of three salads, with the option to add tuna, chicken and or grilled avocado (highly recommended), into the mix for an additional cost. 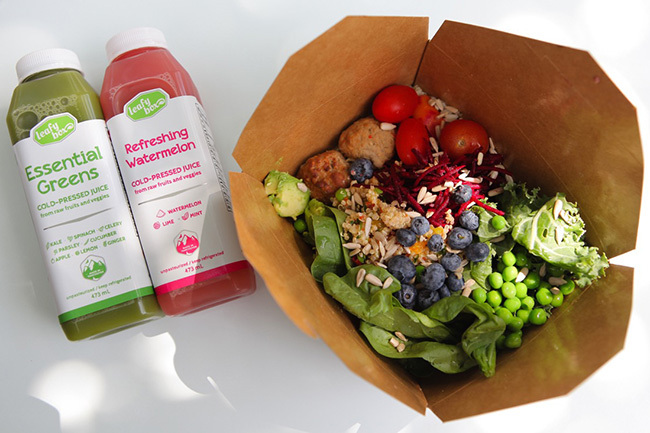 In addition to their popular smoothies, Leafy Box, in Yaletown, offers patrons plenty of fruit and veggie ingredients to pick from as they choose their favourite lunch-time salad combinations. With nourishing, fresh produce the Leafy Box presents a neatly organised range of chopped and diced raw vegetables, in addition to freshly cut fruit, boiled eggs, beans, nuts and pasta. While it’s super easy to leave the Leafy Box with an overflowing tub of salad, it’s important to note that prices for these custom-built salads are dependent on weight. 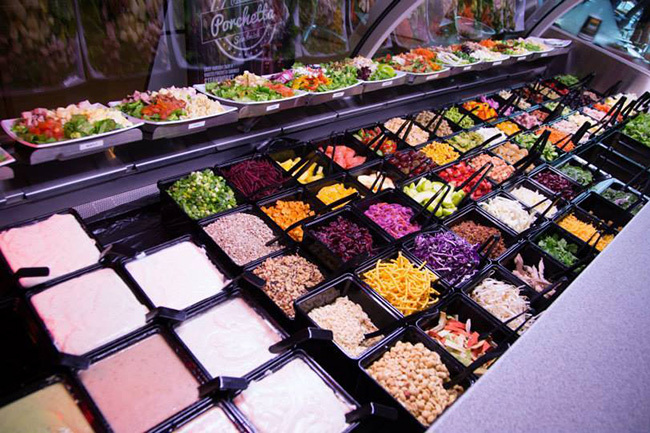 Custom-build your own salad at this make-your-own salad bar on Bute Street. With strong Mediterranean influences, this family owned and run salad bar offers an excellent selection of fresh ingredients and mixed greens, as well as homemade falafel, tabbouleh, tzatziki and hummus. 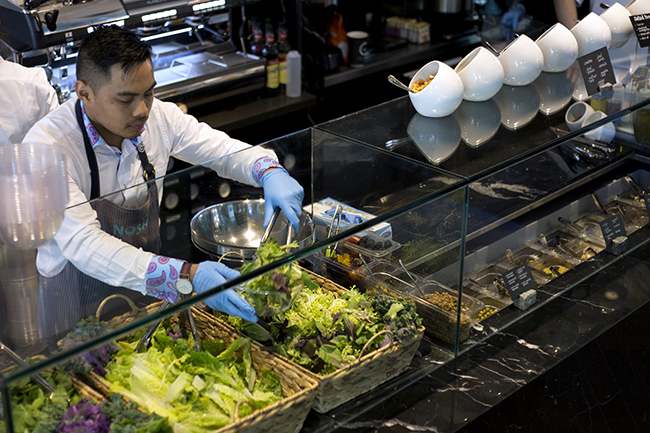 Alongside their signature salad recipes, this Yaletown salad bar allows patrons to create their own salad combinations. Similar to Tractor Foods, in that the staff actually compile the salads, Saladworks offers a lot of choice when building a salad; there are buckets of fruit, vege (raw, prickled, roasted), cheeses, cold cuts, herbs, beans, nuts and antipasto bites (artichokes and sun-dried tomatoes). 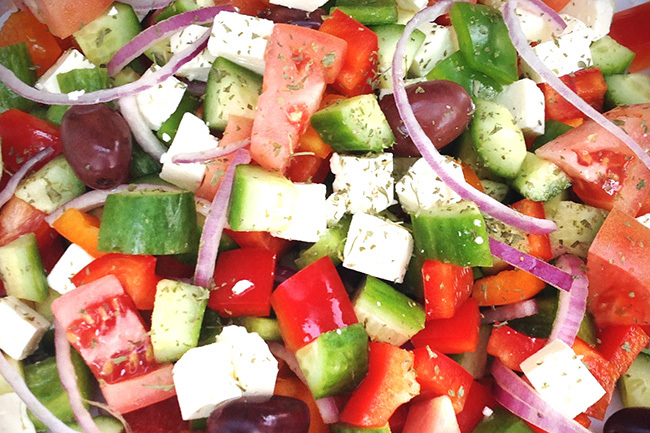 Diners are encouraged to create their own salad and can choose any base, five toppings and their preferred dressing. Customise your own salad bowl at the Whole Foods Market Cambie branch. Offering a smorgasbord of raw, vegan, vegetarian, and organic options, Whole Foods shoppers can pile an assortment of vital nutrients onto their plate. Located in the Public Market on Granville Island, Fraser Valley Juice & Salad Bar is known for their fresh salads, steamed and stir-fried vegetables, salad rolls, and freshly squeezed juices. 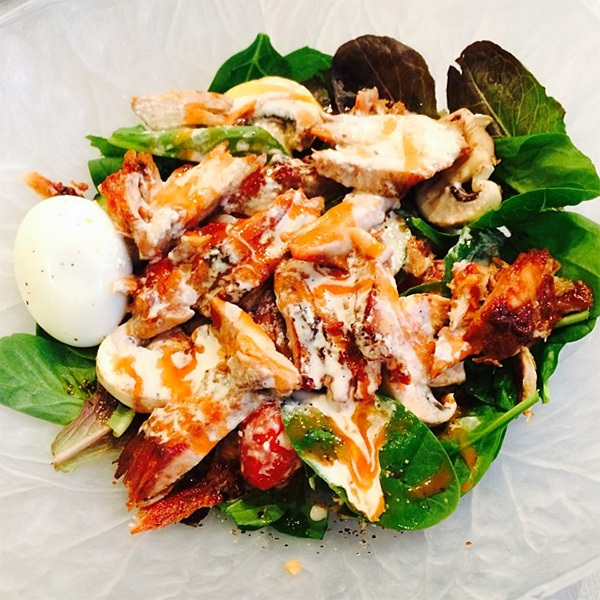 Chopped on the premises, Fraser Valley’s salad selection focuses on health and quality. Customers can choose between a varied selection of organic greens, lentils, couscous, beans, and quinoa. 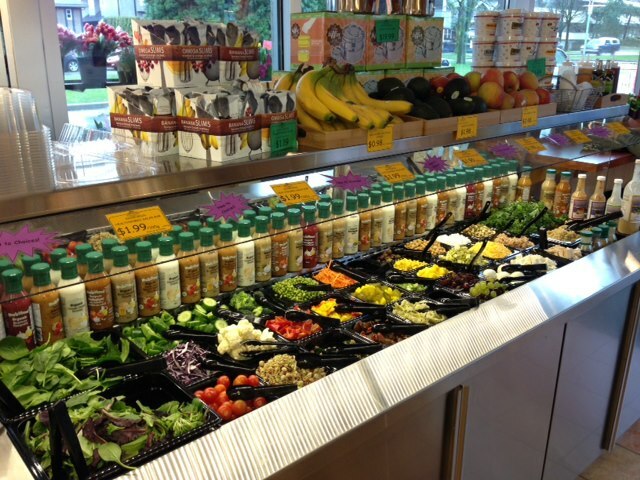 Another build-your-own salad bar option, Choices Market in Kits offers leafy green bases, dressings and a plethora of colourful vegetables and meat ingredients. 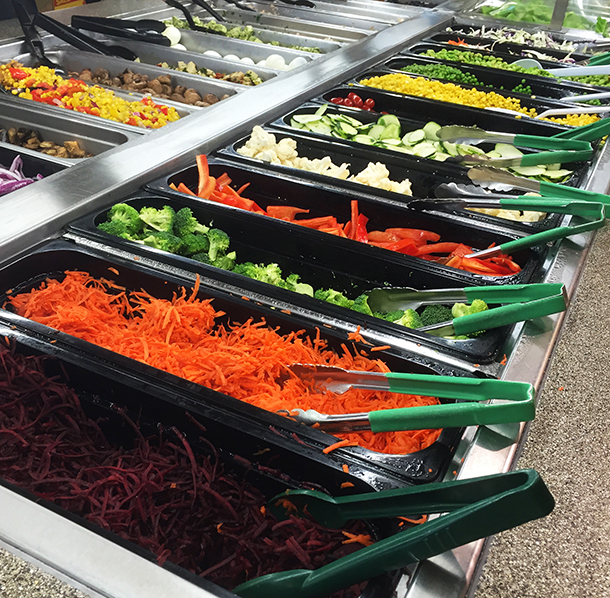 With such a wide variety of seasonal salad options, Choices Market is a convenient spot for those wanting to grab a quick, filling lunch of mixed greens.